As industrial plant systems have increased in scale and their automatic control algorithms advanced, the need for plant simulator systems for training plant operators has been increasing. To meet this need, we have developed a software package that facilitates configuration of a plant operator training simulator system using Extended Test Functions for the CENTUM CS 3000. By connecting Extended Test Functions to a plant model using the features of this package, the user can easily configure an operator training system on a personal computer allowing the same operations to be performed by trainees as would be at an actual HIS. Systems Development Center, Industrial Automation Systems Business Div. As industrial plant systems have increased in scale and their automatic control algorithms advanced, today's operators are required to have more advanced skills and knowledge of theplant systems and to learn the actions to be taken in response to any possible situations including emergencies. Nevertheless, obtaining such knowledge and learning such operations on a real plant carries with it risks and doing so without jeopardizing the plant requires years of experience. This has been increasing the necessity for operator training with a simulator that has the look and feel of the actual plant control system. In a training system, not merely the steady state of the user plant but also abnormal states that cannot be realized in the actual control system can be easily simulated, allowing the skills of the plant operators to be improved within a short period. With the new software package we have developed, the user can effortlessly configure an operator training system for the actual plant controlled by the user's CENTUM CS 3000 system, on a personal computer using the operator training interface and Extended Test Functions for the CENTUM CS 3000. This paper introduces the major features of an operator training system that uses data of a CENTUM CS 3000 system controlling an actual plant. 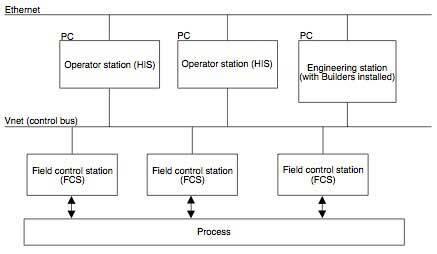 Figure 1 illustrates the configuration of a CENTUM CS 3000 system for an actual plant, and Figure 2 shows for comparison the configuration of an operator training system. HISs of the CENTUM CS 3000 are available in three styles: console, industrial PC, or ordinary PC. Regardless of the style of the HISs used for an actual plant, the training system can use ordinary PCs. Communications between an operator station (HIS) and field control stations (FCSs) in a CENTUM CS system for actual plant control are performed via the Vnet control bus. While, in a training system, communications between the virtual HIS and FCS simulator within the same PC are performed via the virtual Vnet, and communications between virtual HISs and FCS simulators over different PCs are via Ethernet. This feature of emulating Vnet on Ethernet has enabled inter-station data communications to be performed in the same way as in an actual plant control system. A training system uses an FCS simulator in place of an actual FCS. Since multiple FCS simulators can run on a PC, two or more FCSs can be simulated on a single PC. In place of an actual HIS, a training system uses a virtual HIS having exactly the same features as an HIS used for actual plant control. A virtual HIS can be run on a PC that also runs the aforesaid FCS simulators and on an independent PC, whichever is preferred. Engineering functions (Builders) used for configuring and modifying a CENTUM CS 3000 system for actual plant control can be installed and are run in an operator training system without any change. Thus, most applications that are running in an actual plant control system, such as graphic windows, can also be run in an operator training system without change. 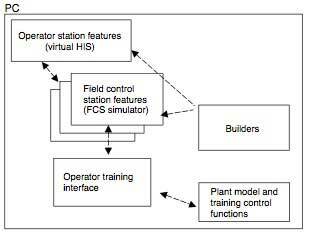 To configure an operator training system, a plant model that simulates dynamic, physical characteristics of a target plant, such as characteristics of temperatures and pressures, is a requisite. Although it is possible to build a model by simply defining necessary loop-back functions, many dynamic simulators that can reproduce changes in physical properties and the physical causalities at high fidelity have already been embodied to date. Besides, training control functions for starting and stopping training, reproducing a status quo, etc. are also needed. 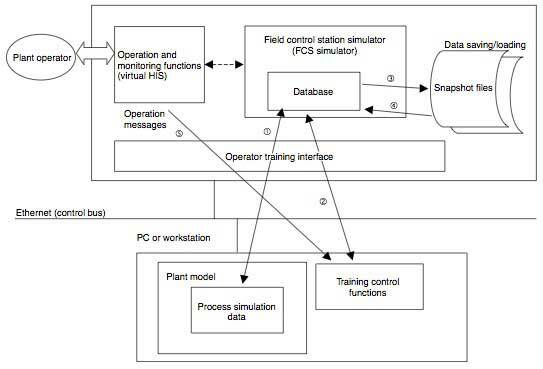 For a small-scale plant control system, all the aforementioned features can be packed in a single PC to configure an operator training system in it as shown in Figure 3. A request from the training control or process simulator to an FCS simulator is issued via the operator training interface. Complex actions to an FCS simulator are performed within the operator training interface so that a request for an action can be easily invoked via the training control or process simulator. The operator training interface features the following functions required for a training system. In accordance with the progress of the training, the execution of all function blocks running in an FCS simulator can be paused and restarted all at once upon request via the operator training interface to stop and restart those blocks' actions such as PID computations and timer advancements. Upon request from training control, the status quo of all function blocks running in an FCS simulator can be saved as snapshot data during training. Saved snapshot data can be loaded back to restore a past control status. These functions enable the training to start from one of various statuses that were previously prepared, and a particular status to be restored repeatedly during training. The control actions of all function blocks running in an FCS simulator can be quickened and slowed down to change the speed of the training. This allows a period with little changes in state to be cut back to reduce the total time of the training, and a period with drastic changes to be advanced unhurriedly. Operator actions can be notified to the training control as operation messages. By analyzing these messages, a series of operator actions can be reproduced, and each operator's actions during the training assessed. 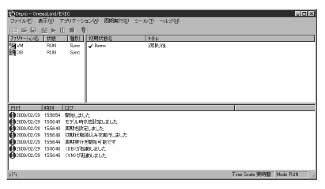 The information of the operator training environment, such as the dates when the individual control stations' databases were modified last, can be acquired. Provides modulus parts that can be connected on graphics for efficient modeling of a plant. Provides a wealth of well-designed libraries of unit models, physical properties, and physical property calculation methods. Examples of a training system having the aforementioned features are Plantutor and OmegaLand, both from Omega Simulation, Co., Ltd. Figure 5 shows an example of a simulator system connecting OmegaLand to a CENTUM CS 3000 system. 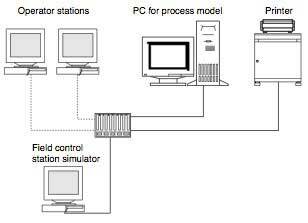 The PC shown as the "PC for process model" in the figure runs Visual Modeler to execute a dynamic simulator, and the execution control module to control the implementation of the overall training. Figure 6 shows the OmegaLand window for the execution control, via which the user invokes requests for training actions. It is predicted that the need for an operator training system will continue to increase. 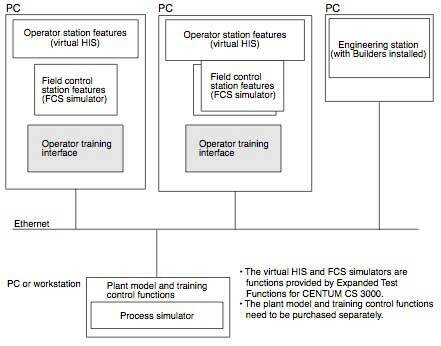 As introduced in this paper, a CENTUM CS 3000-based operator training system uses exactly the same control, operation, and monitoring functions as in actual plant operations, as well as presents the realism of actual plant operations. Another merit of an operator training system is that a new control method and operation scheme can be tested before putting them into actual use, leading to improved efficiency of plant modification work.